Fred is also the author of Thirty Years of Riding The World's Biggest Waves (out of print); he has ghost written for other surfers and athletes and his articles have appeared in Life Magazine, Life International, Surfer Magazine, Surfing and Sports Illustrated. Surfing any wave digs deeply into one's passions and ability to focus, and deletes all intrusive thoughts. You become the wave with Van Dyke. You experience horrendous wipe outs and learn what has to be done to survive. Training, proper nutrition must be considered to move forward, gain strength. Learn to pick the right board for you. Learn tricks and gimmicks to catch waves in crowded conditions. Van Dyke says start in easy surf and build slowly, gaining confidence as you grow in ability and stature. 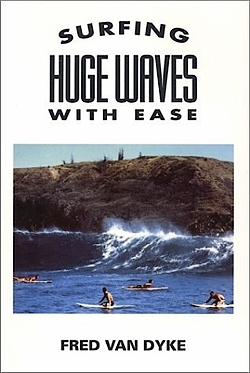 It's not the size of the wave that determines the big wave rider, but the degree of desire. It doesn't have to do with competitive contests. It's an inner space filled with zest for huge waves. Fred Van Dyke, retired teacher, is proclaimed a living legend in the surfing world. Fred lives on the cutting edge of society, falling through the cracks whenever possible. He values free time like a broker who invests in the stock market. In surfing Huge Waves With Ease, he prepares and launches into high adventure, riding 25 foot plus waves. You'll love every moment!